Our sincere apologies to anyone who showed up on October 29. We forgot to announce that we needed to cancel. We’ll not let that happen again! The new date is (weather permitting) Saturday Nov 18. We’ll meet at the Marina Trailhead at 9:45 and begin our walk in at 10 AM. Contact lowersection@gmail.com with questions or to RSVP. More info on this post. Heavy rains last Monday exposed a culvert, and caused other damage to the lower section of the West River Trail. Please come to our trail work day this Sunday, June 25, from 1-5 PM to help maintain our community trail. Meet up at the Fox Farm Rd trail access. Wear your boots and work gloves, bring bug spray and water. We’ll have tools! The trail really needs your help! Thank you! Email us at lowersection@gmail.com for info or questions. Do you love the West River Trail? Please come help out at our Volunteer Trail Work Day scheduled for Sunday, June 25, from 1-5 PM. Meet us at 1 at the Fox Farm Rd Trail Head and stay as long as you like. Bring work gloves, water, insect repellent, loppers. We’ll have shovels and other tools. We’ll be working on improving drainage in some wet areas and trail clearing where needed. Email lowersection@gmail.com for more information and to let us know you’re coming. Thank you! Please come help improve the Lower Section of the West River Trail on Saturday, May 21st, 10 am – 2 pm. Lunch will be provided. Meet up at the Marina Trail Head in Brattleboro, VT at 9:45 am. We’ll be doing some drainage and culvert clearing, removal of fallen trees, removal of invasive black swallow wort on the Riverstone Preserve and having fun! Please bring work boots and gloves, bug spray and water. We’ll provide shovels, rakes and hoes, but feel free to bring your own tools. For more info, contact Jason Cooper at jason.cooper10@gmail.com. Many hands make light work. Hope you can join us! Posted on behalf of Jason Cooper, Workday Coordinator. A big thanks to workday volunteers Elijah Cooper, Jennifer and Jahvon Parker, Dave Cohen and Rachel Zamore and their son, Eli and a friend. We got lots done! 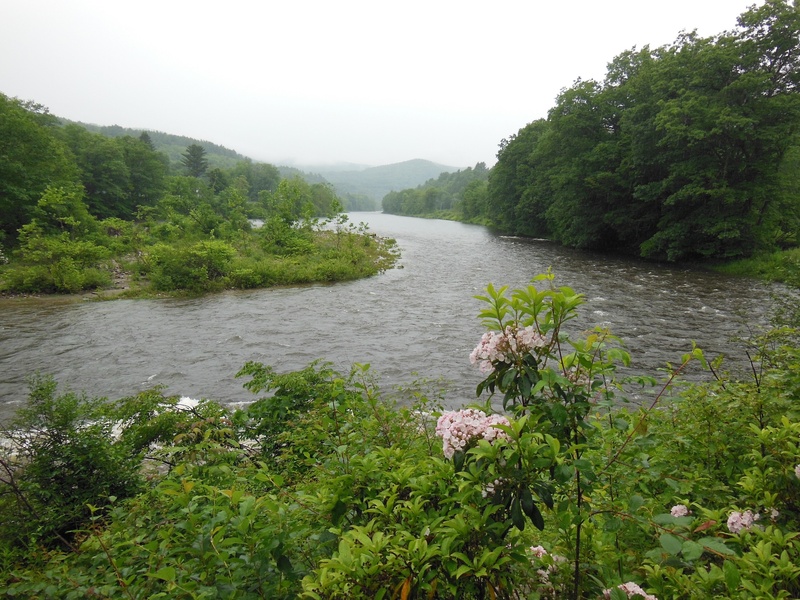 Volunteers moved rocks, cleared drainage, cut trees and branches, removed trash and pulled knotweed from a several-hundred square-foot patch of knotweed along the river bank, that had re-sprouted from where the VYCC had cleared last fall. Thanks to all for a very productive day! Hope you’ll join us next time…stay tuned for info about the next workday. “It was a beautiful fall day. Cool with just a hint of rain at one point. We repaired some erosion on the hills of the I-91 bridge construction bypass trail. Beyond that we cleared drainage culverts and ditches, drying out some wet spots and cleared several branches that had come down along the trail. We even had one volunteer who replaced the gate post that someone had pulled out of the ground at the Rice Farm trailhead. We got a lot done! As we were wrapping up for the day people began pulling out cheese, chocolate, hot cider and goodies to share, tasty rewards for a job well done, a few hours well spent, in the good company of others. Many thanks to Michael Esposito, Lester Humphreys, Malcolm Moore, Scott Hurley, Kathleen White, Jim Webster, Hank Lange and Marcia Steckler for coming out to help improve the trail. And to Elin Waagen for taking photos. The trail is now clear and in good shape for the winter. As I rode the trail this past Sunday I was pleased to see how many people of all ages were out enjoying it”. In honor of National Trails Day (June 7) please consider volunteering to improve the lower section of the West River Trail! Our next Volunteer Trail Workday is Sunday, June 15 from 10 AM to 2 PM. We will gather at the Marina trail head and leave at 10 AM. Wear work shoes that can get wet; bring gloves, bug spray, and drinking water. Most of the work will be improving drainage–cleaning out drainage ditches and repairing some parts that have washed out. Maybe a bit of chainsaw work. We will provide the tools. For more information, contact Jason Cooper at jason.cooper10@gmail.com We look forward to seeing you there! Please come out and help improve the West River Trail!. Thanks!